This is a wonderful dessert that my husband once requested I make after seeing a certain Seinfeld episode. This will make 16 slices. In a large bowl, dissolve 1 tsp sugar and yeast in milk. Let stand 5 minutes. Stir in 6 Tbs sugar, vanilla, 1/4 tsp salt, and egg yolk. Add 1 1/3 c all-purpose flour and bread flour to milk mixture. Stir with a danish dough whisk, or wooden spoon, until well blended. Add 5 Tbs butter, stir until well blended. Scrape dough out onto a floured surface. Knead until smooth and elastic (about 10 min). While kneading, add about 1/3 c all-purpose flour a little at a time, to prevent the dough from sticking to your hands. Place the dough in a large bowl coated with vegetable oil, turning to coat top. Cover and let rise in a warm place 1 1/2 hours or until doubled in size. Punch dough down then cover and let dough rest 5 more min. Line the bottom of a 9 x 5 pan with parchment paper. Coat the sides of pan with vegetable oil. Combine 1/2 c sugar, cocoa, cinnamon, salt, and chocolate in a medium bowl and set aside. Place dough on a floured surface. Roll dough out into a 16″ square. Sprinkle filling, leaving a 1/4″ border around edges. 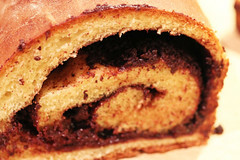 Roll up dough tightly, jelly-roll fashion and pinch seam and ends to seal. Holding dough by ends, twist dough 4 times. Fit dough into pan. Cover and let rise 45 minutes or until doubled in size. Preheat the oven to 350°. To prepare streusel, combine powdered sugar, 1 Tbs and 1 Tbs softened butter, stirring with a fork until mixture is crumbly. Sprinkle streusel evenly over dough. Bake for 40 minutes. Cool bread in pan for 10 minutes on a wire rack. Remove from pan and cool bread completely on wire rack before slicing. That looks good. I love pretty much anything chocolate. So glad you like it. We have enjoyed this a lot!